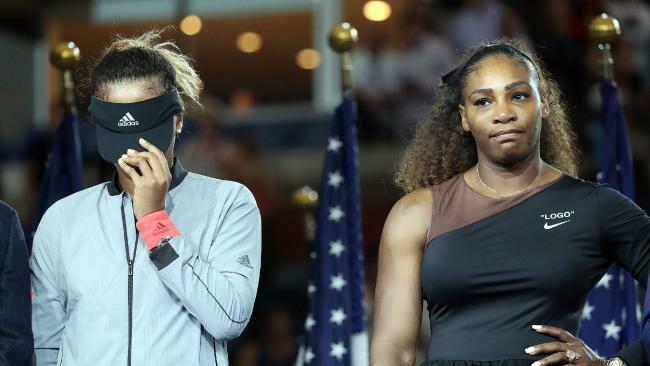 FIVE days after her historic US Open victory, Naomi Osaka has spoken about what really went down on the podium between the 20-year-old and her childhood idol, Serena Williams. Osaka became the first-ever Japanese-born Grand Slam champion on Saturday after her stunning defeat over the former World No.1. 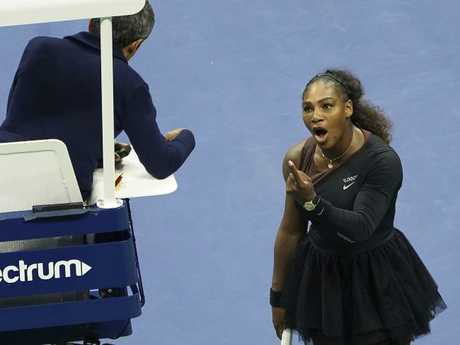 The rising tennis star's victory was sadly overshadowed by a firestorm of controversy after Williams confronted chair umpire Carlos Ramos and was slapped with three code violations. After taking out the match in straight sets, 6-2, 6-4, Osaka and Williams appeared together for the trophy ceremony, during which audible boos erupted from the crowd. In a raw moment, the 23-time Grand Slam singles winner reached over to comfort her young opponent and whisper something in her ear. Osaka, who was noticeably teary during the ceremony and at one point pulled her visor down over her eyes, appeared on The Ellen DeGeneres Show on Wednesday and cleared up exactly what her idol said to her. "She said that she was proud of me and that I should know that the crowd wasn't booing at me," Osaka told DeGeneres of the emotional moment between rivals. "At the time, I did … think that they were booing at me. I couldn't tell what was going on, because it was just so loud in there. It was a little bit stressful." Reflecting on her incredible victory, Osaka said she always believed she had a chance to beat Williams. "I wouldn't play a match without thinking I had a chance," she told DeGeneres. "The back of my mind, I thought so." Osaka also commented on her rival's on-court outburst, saying she was trying to remain focused while Williams accused Ramos of making "a sexist remark" and demanded an apology. "When you're little, you're taught not to look at, like, if your opponent gets angry or anything," Osaka said. "You're told to just turn around and try to focus, so I tried to do that, but in my mind I was sort of - like I really wanted to know what was going on." She continued, "I couldn't hear and I was looking away, but I heard a lot of people in the crowd making noises, and I really wanted to turn around, but I didn't." According to a new report in The Times, the 2018 US Open winner is set to sign the biggest deal Adidas has ever made with a female athlete, to the tune of $11.9 million annually. Osaka is already on Adidas's payroll, however is only reportedly making a "six-figure" salary that will expire this year. If the monster contract goes through, it would be the biggest deal the apparel giant has ever given to a female tennis player and could propel Osaka up the ranks on Forbes' 2018 list of highest paid female athletes, which Williams currently leads. In 2010, tennis star Maria Sharapova made history by signing the most lucrative female sports contract ever with Nike - a 10-year contract worth an estimated $97.6 million.